Multifunction world time clock. Alarm. Clock. Date. Calender. Easy to use keys. 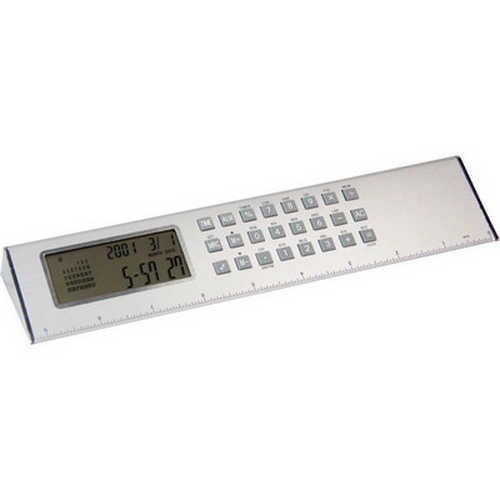 23cm and�9 dual�ruler. Aluminium construction. Product Size: 240 x 65 x 25mm. Product Packing: Boxed. Decoration Size: 40 x 40mm. Decoration Position: Front face. Decoration Method: Pad Print. Carton Quantities: 50. Carton Size: 53 x 47 x 29. Carton Weight: 10. Colour: Silver. Price includes : Pad Print 1 Colour / 1 Position. Setup is included.